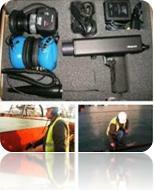 We use modern NDT equipment and other tools to carry out various type of inspections. Such inspections are, but not limited to hatch water tightness inspection using ultrasonic equipment, Thermal Imaging, Infrared Thermometers. 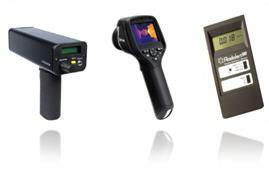 Inspection supporting special equipment like radiation monitoring, equipment for downloading temperature from refrigerated container data loggers, equipment for retrieving temperature records from reefer container, moisture meters e.t.c..
We are proud with introduction is scope of our services the thermal imaging inspection. Use of thermal imaging give us ability to make more detailed inspection of frozen, chilled and other products, inspection of reefer chambers and warehouses, inspection of thermal insulation, monitoring of cargo surface temperature over large areas of warehouse. 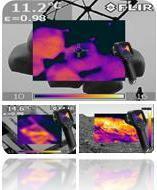 The use of thermal imaging gives to our surveyors ability to make more detailed warehouse risk assessments. In fact, one of the main reasons of cargo damage remains wetting of cargo due to non-watertight condition of hatch covers, which remains a main problem for carriers, ship owners and insurers. The testing of hatch covers for the water tightness using ultrasonic equipment is very convenient and economical way. This kind of inspections is essential for the vessel pre-entry condition survey required by P&I Clubs. Our company certified in accordance with IACS and Class Society requirements to carry out such type of services. We suggest to our clients such inspections not only as part of vessel pre-entry survey, but as economic and preventive measure to maintain hatch covers watertight. 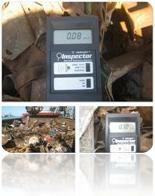 Inspection of radiation level a very important point during import&export of steel scrap shipments. The inspection of other metal products could be carried out at request. The equipment we use is highly portable ready to use at any required time and may measure Alpha, beta, Gamma and X-radiation. The readings could be reported at your choice in CPM (counts per minute) and mR/hr or to the international standard of µSv/hr. Frozen and chilled products shipped in reefer containers. In fact, in case of damage the question will raise about the reasons of such damage and at first instance will be checked the temperatures. However, more often consignee observes normally working container and temperature on container display within specification. In order to investigate cause and circumstances, particularly at which date&time and what was the Supply temperature, Return temperature, Fresh air exchange, concentration of CO2 and O2. 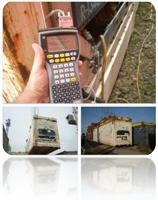 surveyor need to retrieve such data from reefer unit data logger. We will retrieve for you this data and this will give us ability to investigate cause of cargo damage and responsible party.